Traditional media caricatures come in two "flavors". Black and White, and Color. 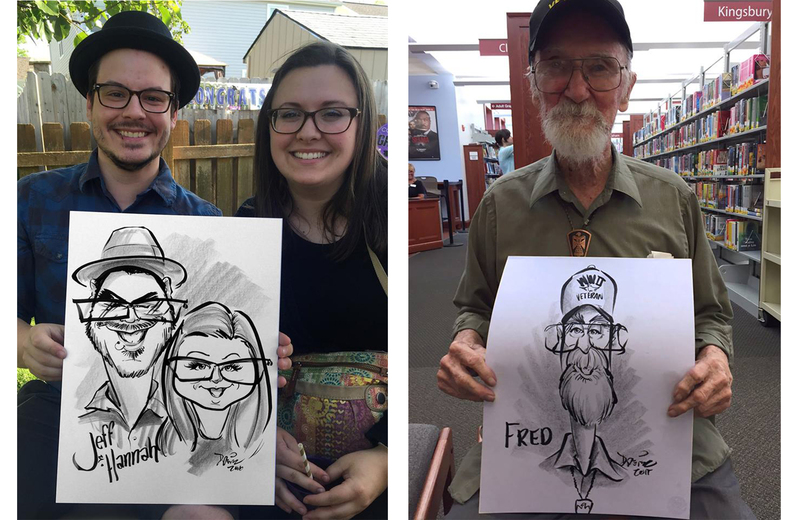 Black, white, (and Gray) traditional caricatures is fast...real fast! Most people only take 2 1/2 minutes to draw. 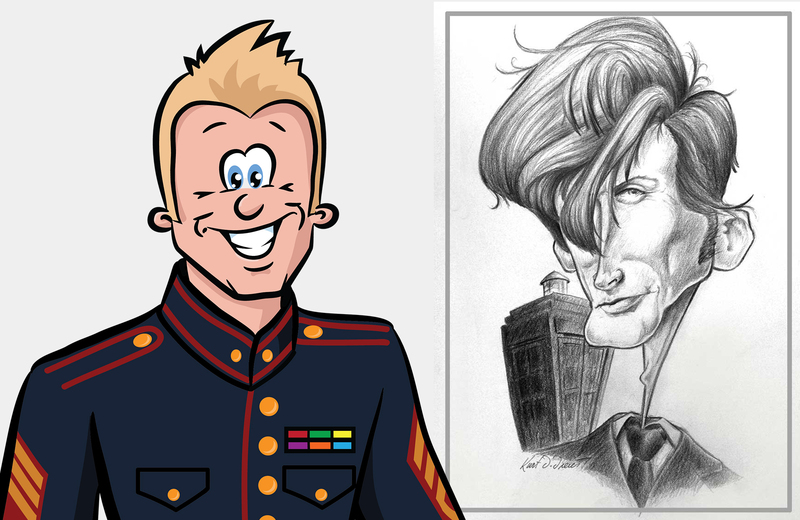 That means I can typically draw 15-20/ hour *and offer the most caricatures per hour. I draw traditional media caricatures with black marker and accented with Prismacolor Artstix, which are very resistant smudging and to fading, on heavy weight 12 x 16 paper. and offer the most caricatures per hour. Color caricatures are done in black marker and accented with colored ArtStix. ArtStixs are colored pencil blocks that act like pastels but superior to pastels because they are very resistant to smudging. For a small additional fee you can have your Logo or Theme pre-printed on the paper to extend your company branding or as reminder of the event. Pricing ranges for $150/hr throughout the year and $175/hr at peak times. *Many factors affect the number of drawing per hour that can be done so the numbers are approximate and can not be guaranteed. What are digital caricatures? Digital caricatures are caricatures drawn on the computer, projected or displayed on large monitors, and printed in just minutes, emailed, or made available for download after the event. You company logo can also be applied to add additional advertising. 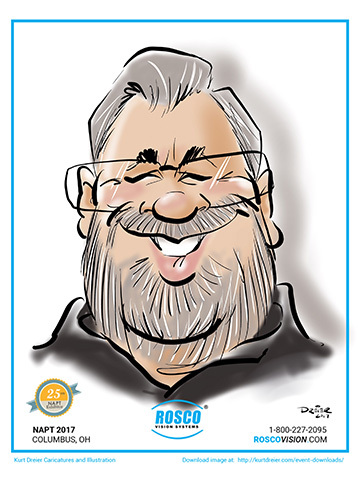 Digital caricatures can be done at the rate of 8-12 per hour* and are done in full color as 4" x 6" prints. For an additional fee lanyards and plastic sleeves can be provided adding a unique way to further showcase your brand. Great for trade shows and meet and greets. We also produce traditional and digital media custom illustrations and caricatures. Great for publication, and personal gifts. We can tailor an illustration using traditional or digital media. From major campaigns to personal commissions we can produce the unique, high quality, custom images in a variety of mediums. We don't want to sound vague but...Custom illustrations and caricatures take much longer than event caricatures so prices will vary. Please call or email us to talk about your special project. We will provide Great fun for your guests! +many factors affect the number of drawing per hour that can be done so the numbers are approximate and can not be guaranteed. Click on the button to contact and tell us about your event. We will be quick to get back with you and discuss with you how we can make your event a memorable one.